Minijuegos is announcing the release of their new game for iPad called Spiderly HD 1.0. Spiderly is the second game released for iPhone by Minijuegos- the number one gaming site in Spain and Latin America today. After the big success they decided to launch HD version for iPad users. Just released iPad version includes better graphic quality, more speed and more spiders attacking. Spiderly HD is an excellent for the big screen of the iPad. 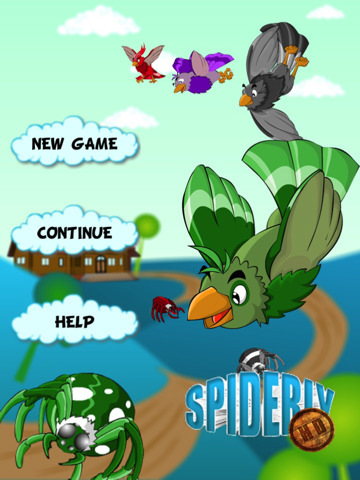 In this game you control 4 birds that will help you against the evil spiders. After talking with Alberto Cenalmor, creator and lead programmer of both versions, we got some hints about the next things coming soon for Spiderly HD, more levels, a second episode and an arcade mode that has to be unlocked finishing the history, composed of 19 levels. Spiderly HD 1.0 is only $0.99 USD and available worldwide exclusively through the App Store in the Games category.